This year witnesses the 100th anniversary of the sinking of the titanic - the largest passenger steamship in the world at this time - which happened while on her maiden voyage from Southampton, England, to New York. 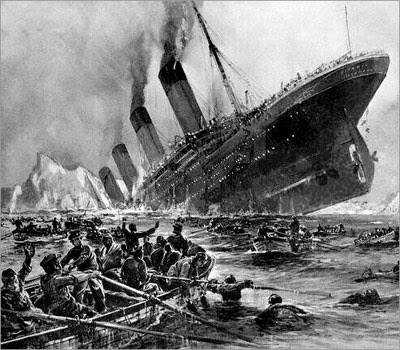 This terrible tragedy occurred on April 15, 1912, and resulted in the deaths of 1,517 people. This shipwreck also turned out to be one of the deadliest peacetime maritime disasters in history. Why? Well, it was partly due to the shiping regulations of the time as the ship carried lifeboats for only 1,178 people. Even so, a disproportionate number of men died due to the "women and children first" protocol that was enforced by the ship's crew. This procedure meant that many of the lifeboats ended up only being half filled. This was a tragedy in itself as since the sea was calm, it would have been safe to fill all boats to capacity and thereby rescue an additional 500 persons! Furthermore, only a few passengers were picked up from the water after the sinking out of fear of the boats being overfilled or capsizing. Luckily for Father Frank Browne, he didn't get to experience the horrors of what happened next! The sinking of the Titanic - minute by minute. 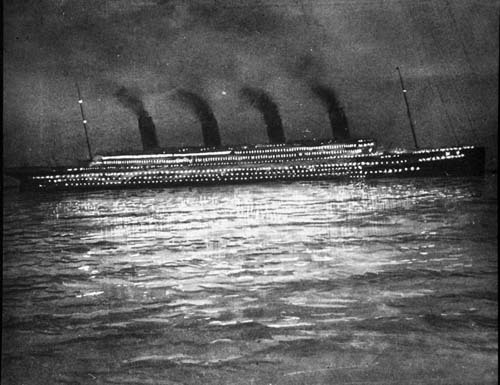 At 11.40 pm (ship's time), lookout Frederick Fleet spotted an iceberg immediately ahead of Titanic and alerted the bridge. First Officer William Murdoch ordered the ship to be steered around the obstacle and the engines to be put in reverse, but it was too late. 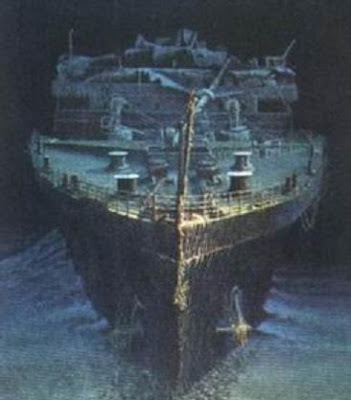 The starboard side of Titanic struck the iceberg, creating a series of holes below the waterline. Unbelievably, five of the ship's watertight compartments were breached, and it soon became clear that the ship was doomed. Why? Because she could not survive more than four compartments being flooded. 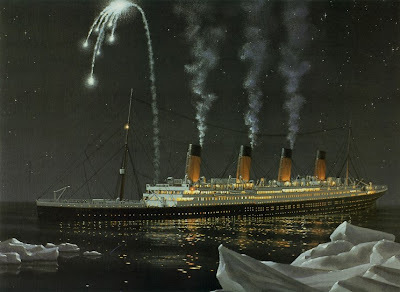 The Titanic began to sink - bow-first, with water spilling from compartment to compartment as her angle in the water became steeper. Those aboard Titanic were poorly-prepared for such a terrible emergency. There was only enough space in the lifeboats for a third of her maximum number of passengers and crew, and worse still, the crew had not been trained adequately in carrying out an evacuation. Furthermore, the officers did not know how many they could safely put aboard the lifeboats and launched many of them barely half-full. As the nightmare progressed, third-class passengers were largely left to fend for themselves, causing many of them to become trapped below decks as the ship filled with water. A "women and children first" protocol was put in place and generally followed for the loading of the lifeboats and most of the male passengers and crew were left aboard. Two hours and forty minutes after Titanic struck the iceberg, her rate of sinking suddenly increased as her forward deck dipped underwater and the sea poured in through open hatches and grates. As her unsupported stern rose out of the water the propellers became exposed. After this, the ship split apart between the third and fourth funnels due to the immense strain on the keel. At 2.20 am, the stern sank, pitching the remaining passengers and crew into lethally cold water with a temperature of only 28 °F (−2 °C). Almost all of those in the water died of hypothermia or cardiac arrest within minutes. Incredibly, only 13 of them were helped into the lifeboats though these had room for almost 500 more occupants. Distress signals were sent by wireless, rockets and lamp, but none of the ships that responded were near enough to reach her before she sank. A nearby ship, the Californian, which was the last to have been in contact with her before the collision, saw her flares but failed to assist. Around 4 am, RMS Carpathia arrived on the scene in response to Titanic's earlier distress calls. 710 people survived the disaster and were conveyed by Carpathia to New York, Titanic's original destination. Another 1,517 people were lost, either drowning inside the sinking ship or freezing to death on the surface (kept from drowning by their lifebelts).